Join us for today’s Happy Hunting! in the treet.tv studios in Garden of Dreams at 3pm, Friday 14th December, to learn about the great seasonal hunts that are going on across the grid, to find out all about the SL Christmas Expo – and the Race for the Bells – and to see the final installment of Season 1 of The Blackened Mirror – and it’s a shocker! Rosamoo Mendelsohn of Hunt SL, our hunt reporter, has decked out our studio with a positive feast of goodies that can be obtained through the seasonal hunts. She will be on hand to share all the latest hunt news with our host Cinders Vale, and some examples of the wonderful items she’s found. Then it’s off to the SL Christmas Expo, where Cinders talks to Amanda Yven, who is the organiser for the Race for the Bells – and you’ll have a chance to see them in the beautiful Prim Perfect Pavilion, designed by Eliza Wierwight of Patron. And last, but definitely not least, we have the final episode of Season 1 of The Blackened Mirror. Harland Quinn,Harland Quinn, Alais Alleyn and indefatigable Mr Biggins heading in to danger (rather than trying to escape it). 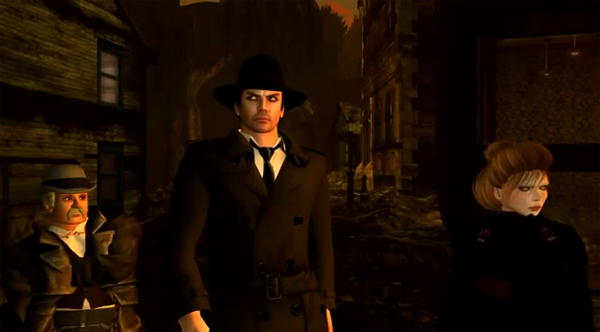 “You know where we’re going,” says Alais to Quinn at one point, and it’s not a question. But how does Quinn know? And what will they find at the end of their journey? 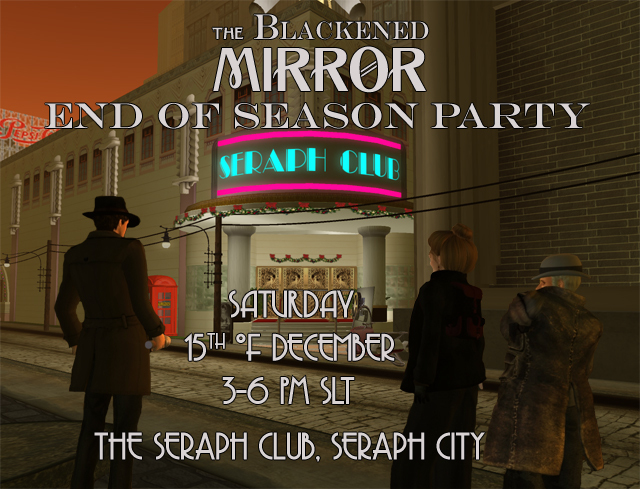 But you can find out by watching The Blackened Mirror today, when it’s broadcast for the first time at 3pm SLT as part of Happy Hunting! And then, tomorrow, you can join us for a celebratory party!